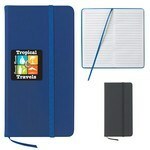 Sometimes a notebook or journal are exactly what a customer needs. Your next convention's swag table will benefit from promotional notebooks and journals that brag about your goods and services. 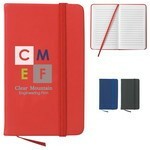 And printed notebooks and custom journals are always great for giving out to clients and prospects. We've got options for every one of those situations, and all fully customizable with your company's branding and logo. Carry 3 ½" X 6 ½" Journal Notebook with you, to jot down ideas and impressions that might strike when you are traveling or eating out. 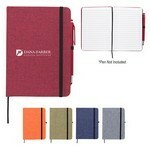 It features an 80 page lined notebook with a PVC cover. 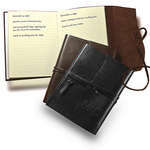 The 3" x 5" Journal Notebook has all the essential features, necessary to inspire you to write. 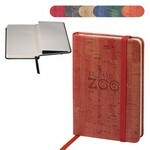 It features a 80 page lined notebook with a PVC cover. 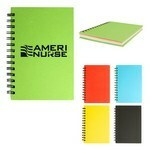 Take notes and make jottings using the attractive 5" X 7" Spiral Notebook with Colored Paper. It features a 100 page unlined notebook with pink, green, yellow, and blue page colors that make note taking a little more exciting. Gift the 5" X 8" Conrad Journal Notebook to your customers, with your company’s logo imprinted on the cover and remind them of it every time they open the journal to pen down notes or ideas. 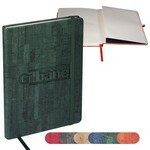 It is a 100 page lined notebook with a smooth matte finish. The Appeel Medio Journal features an eco-friendly binding and cover, customizable with your company logo! Our 5" x 8" Woodgrain Look Notebook features matching bookmark and pen loop and allows inserting brand logo and custom details to Promote your Brand. Our 5" x 7" Heathered Journal features polycanvas cover in beautiful colors and allows inserting custom details to Promote your Brand. 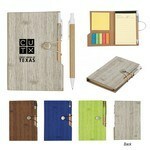 The 4" x 6" Woodgrain Look Notebook w/ Sticky Notes & Flags features matching pen secured with hook closure, Customizable with your logo for Brand Recognition.